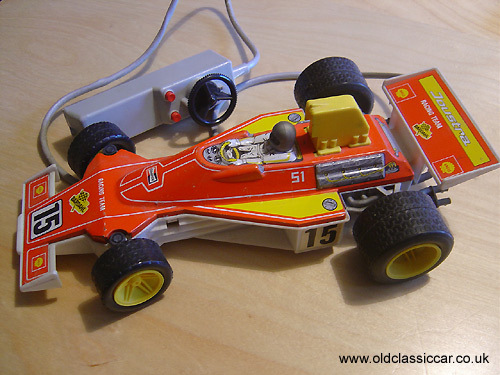 By the 1970s many toy cars had switched from all-tin construction, to a mixture of tin and plastic. This Joustra illustrates the change perfectly. Cars of this era were more likely to be found with battery power rather than clockwork too. This large plastic & tin toy, made by Joustra in France, dates to the mid 70s I suspect, and still has its remote control unit, connected by a cable. Two large battery fit into the handset. The handset has 2 buttons for forward and reverse, and a steering wheel to control the cars direction. The car is liveried with logos from Shell oils, Champion (spark plugs) and Bardahl. The red upper surfaces are in tin, with the lower white section being in plastic. The clip in air box and driver's helmet are still in place - these vulnerable parts are usually the first things to be lost with any well-used example! Colour: red, white and yellow, battery powered and cable remote control.